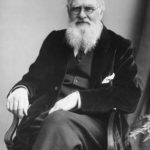 Alfred Russel Wallace was a British naturalist, explorer, geographer, anthropologist, and biologist. He is best known for independently conceiving the theory of evolution through natural selection; his paper on the subject was jointly published with some of Charles Darwin’s writings in 1858. This prompted Darwin to publish his own ideas in On the Origin of Species. Wallace did extensive fieldwork, first in the Amazon River basin and then in the Malay Archipelago, where he identified the faunal divide now termed the Wallace Line, which separates the Indonesian archipelago into two distinct parts: a western portion in which the animals are largely of Asian origin, and an eastern portion where the fauna reflect Australasia. "I am thankful I can see much to admire in all religions." "Civilisation has ever accompanied emigration and conquest – the conflict of opinion, of religion, or of race." "In my solitude I have pondered much on the incomprehensible subjects of space, eternity, life and death." "To the mass of mankind religion of some kind is a necessity." "What we need are not prohibitory marriage laws, but a reformed society, an educated public opinion which will teach individual duty in these matters." "In all works on Natural History, we constantly find details of the marvellous adaptation of animals to their food, their habits, and the localities in which they are found."